Sonthofen, Germany – Unibéton, a French subsidiary of the HeidelbergCement Group, is producing specific ready-mix concrete for the “Grand Paris Express” project. To optimize the production process, the company replaced a planetary mixer with a twin-shaft mixer from BHS-Sonthofen. For the first time in France, the mixer was installed with frequency converters to enhance operations. Grand Paris Express is said to be the largest public transportation and infrastructure project in Europe, comprising four new transit lines and the extension of further three existing lines. In Issy-les-Moulineaux in the suburban area of Paris, Unibéton is using new concrete recipes which require longer mixing times. 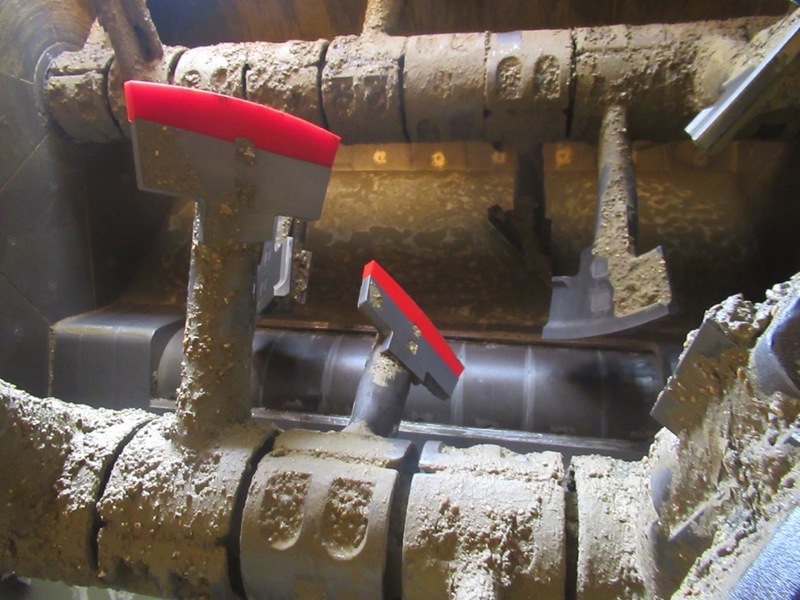 In order to ensure reliable and homogenous mixtures batch per batch, the Unibéton management team decided to replace one planetary mixer with the more powerful DKXS 4.50 twin-shaft batch mixer from BHS-Sonthofen. The three-dimensional mixing concept results in an intensive exchange of materials, and shorter mixing cycles with reduced energy consumption. 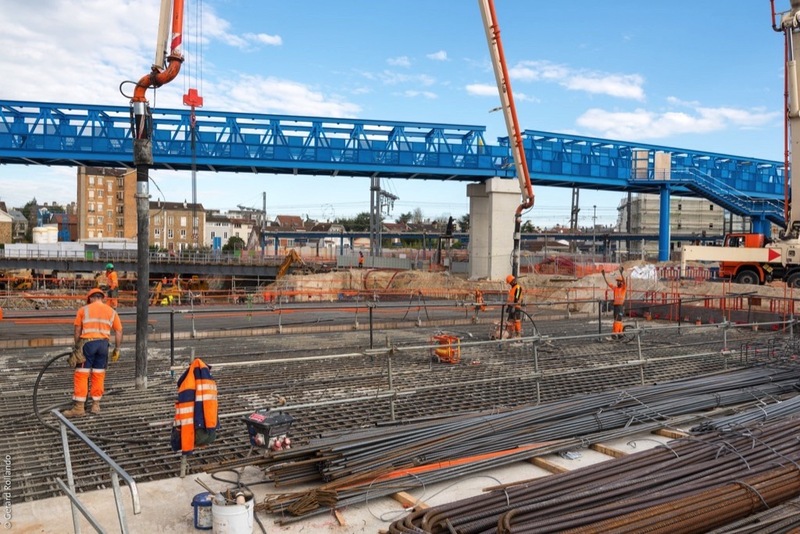 “The civil works companies in the Grand Paris Express project work with concrete recipes that feature a lot of binders, additives and plasticizers. Our technology delivers highly dynamic movement during the mixing processes and is a perfect long-term solution for these new concrete recipes,” says Alexandre Bernabé, technical engineer for the French market at BHS-Sonthofen. The German company invented the twin-shaft mixer over 130 years ago and has continuously developed the technology. Unlike other mixing systems with circular motion, the twin-shaft batch mixer offers a three-dimensional mixing concept that results in an intensive exchange of materials. This happens in the turbulent overlap area of the two mixing circles. This way, the twin-shaft batch mixer rapidly produces mixtures with consistently high levels of homogeneity. In the case of ready-mix concrete, cements and admixtures undergo optimal integration. Admixtures are rapidly and evenly distributed throughout the entire mixture. The three-dimensional mixing concept also leads to shorter mixing cycles with reduced energy consumption. 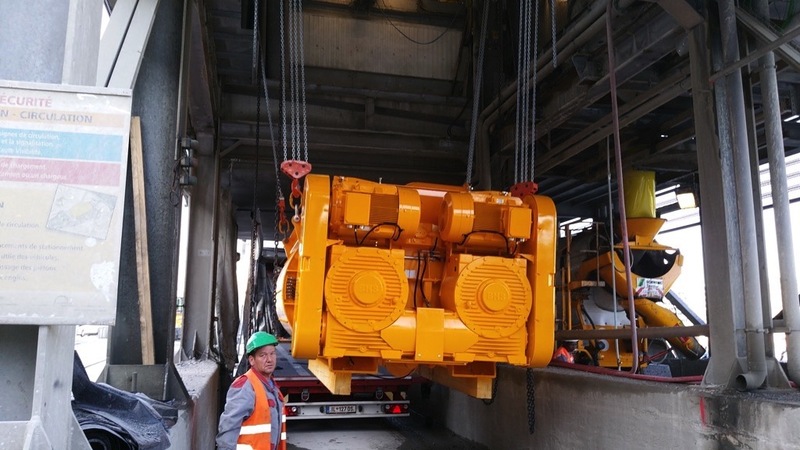 In Issy-les-Moulineaux, the new twin-shaft batch mixer from BHS-Sonthofen increased the quality of the concrete used in the Grand Paris Express project. The new mixer is a major asset to secure the homogeneity of the special concretes. “With this mixing line we are producing close to 750 cubic meters of concrete per day and around 15,000 cubic meters per month,” says Stéphane Haffreingue, responsible for the operations in the Paris area and at the Issy-les-Moulineaux site of Unibéton. “Since the twin-shaft batch mixer has been installed, we have considerably boosted our quality.” The twin-shaft batch mixer is designed with a drive comprising two 80 kW motors that are coupled with frequency converters. It is further equipped with a fully automatic central lubrication system, high-pressure cleaning and a moisture probe. The discharging gate operates reliably using hydraulic cylinders. For Unibéton, BHS-Sonthofen installed a twin-shaft batch mixer of type DKX with two frequency converters for the first time in France. The converters have a key role in processing the specific concrete recipes. “When you work with additives and plasticizers, air bubbles will form in the mixing process. To prevent these air bubbles, we use the frequency converters,” Alexandre Bernabé explains. The frequency converters made by Danfoss are designed to control speed. They slow down the rotation speed at the end of each mixing cycle. As a result, the air becomes less likely trapped in the concrete and passes at the surface of the mix. Taillefer worked with BHS-Sonthofen to put the new mixer into operation quickly. 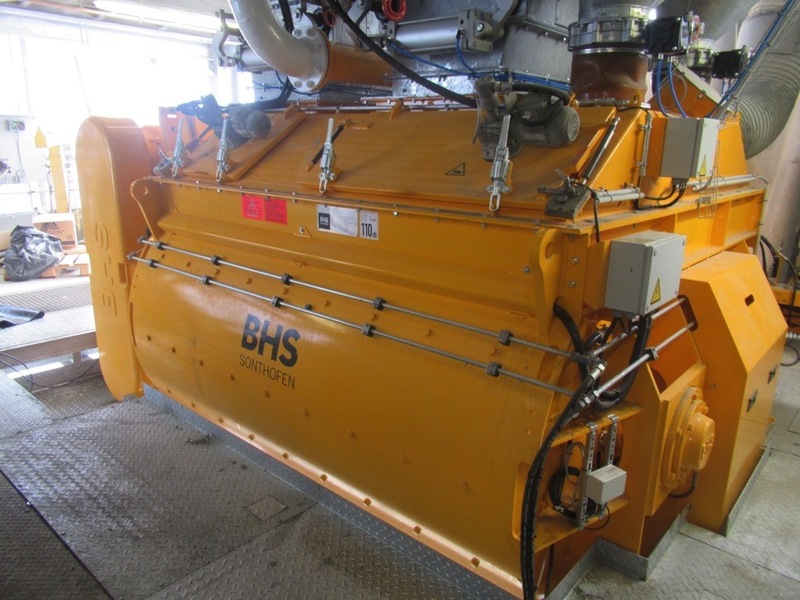 BHS-Sonthofen delivered the mixer on time in August 2017. BHS cooperated with the renowned French industrial boiler specialist Taillefer to put the new mixer into operation quickly. The company took care of the entire replacement process from the disassembly of the old machine and the assembly of the new mixer to installing new steel structures and platforms. Taillefer also supplied the special discharge cone of the mixer, which was designed by BHS. “With two parallel production lines, the replacement was quite a challenge. Thanks to close cooperation with Unibéton and suppliers like Taillefer, we were fully on schedule,” Alexandre Bernabé points out.